As each year passes, the various “firsts” in my life have more meaning. I remember my first day of riding a school bus to Kindergarten – the beginning of a learning journey that continues to this day. The first date I had with my wife definitely changed my life for the better. While my wife and I look back on the date and laugh, we also remember that two weeks after the date I asked my wife to marry me and surprisingly, she said yes! The birthdays of both of our children conjure up fond memories of waiting for their arrival into the world and the continuous joy they have provided to us ever since. I was fortunate enough to cut both of their umbilical chords and be the first to hold them. There are so many more firsts in my life, which hold significant meaning. Tonight, I look back on yet another important first that occurred yesterday. After dropping off my company vehicle on Friday, I found myself in a position in which I’m not accustomed. For the past fifteen years, I have not had one day where I was not employed. During this time, the organizations I worked for enjoyed tremendous success and benefited from the marketing expertise I brought to the table. Yesterday was the first day in a highly successful career in marketing that I was not part of an organizational team. The day, however, was filled with the endless opportunity to help others and stay engaged. 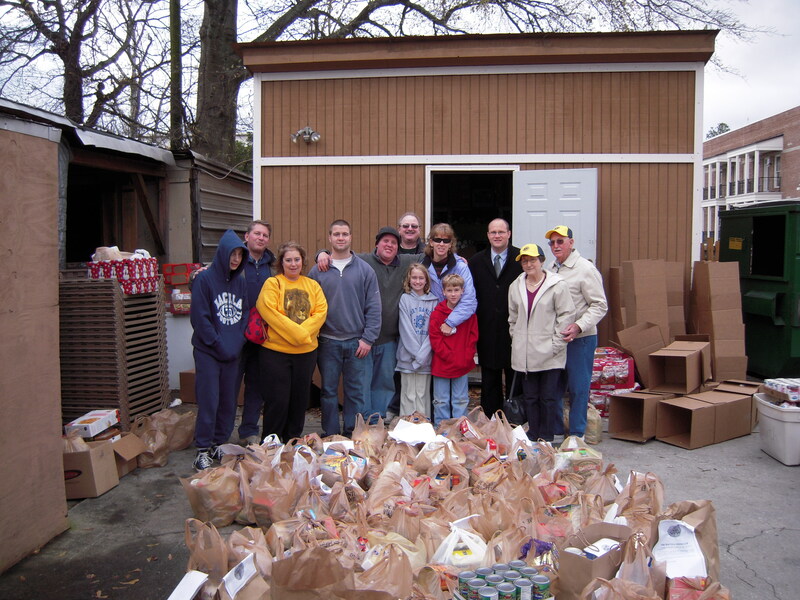 I was fortunate enough to participate in the Dacula Lions Club first service project – a food drive with proceeds being sent to The Quinn House, Gwinnett County’s sole homeless shelter. The Dacula Lions Club members came together with eighty bags of food that were used to feed needy families throughout the county. I was filled with a sense of achievement and pride to be able to play a small part. Our first service project, taking place on my first day of being unemployed. I refused to retreat inward in a sense of worry, for I know that our Lord and Savior Jesus Christ provides for my needs, as well as for the needs of my family. Like many before and after me, I stayed in the game and stayed engaged. It is this attitude that will ensure my time of unemployment is minimized and will help to propel the next organization I’m a part of above its expectations. I stand with many of my friends who have lost their jobs, yet will never lose their hope. Patti Womack serves as a wonderful example. Patti is a dear friend of mine who lives in Phoenix, Arizona and is currently looking for a new position in project management. Her spirit of giving and sense of commitment have not been diminished, as she gives of herself to Packages from Home – a non-profit organization that provides provisions, letters and reminders from home to military heroes serving in Iraq and Afghanistan. You may learn more about Packages from Home by visiting http://www.packagesfromhome.org/. Unemployment is a temporary condition. Providing hope, inspiration and compassion to others should be a lifelong commitment that does not end. I salute Patti Womack and others like her who stay engaged. Temporary unemployment does not stand in their way and it does not stand in my way as I go forward with my journey of serving the needs of others. December 20, 2009 will be remembered as another first day in my life – a day in which I refused to look inward and kept my focus on the greater missions of life. Great stuff Jeff. Good luck to you. Let’s get together soon and plot some adventures of our own! Thank you Todd! I appreciate your kind words. I’ll make contact with you soon, my friend. I agree with you when you said, “Unemployment is a temporary condition. Providing hope, inspiration and compassion to others should be a lifelong commitment that does not end.” My husband is out of work and has been for 1.5 years. I take care of my mother as you know; however I feel that when a person is down, but not out; there is always more time to take care of others. It takes a community of well organized believers to build and sustain a community and a business and no one person can do it alone. I also commend Patti Womack, because she like many others understands this; however it is people like you and I to point out the Patti Womack’s of this world so others can gain a positive momentum about community, love, sharing, giving, and paying this information forward so others can do the same. You are a great inspiration, and I pray that your father is doing better. Growing up, my dad was in the Army. I spent my childhood growing up in eleven states. When people ask me where I’m from, I generally answer, ‘America.’ The first day at new schools was always difficult but it prepared me for all the firsts in my adult life; first apartment on my own, my first credit card bill I couldn’t pay, first time I got to hold my daughter, and my most recent first day, March 14, 2009, the day I started on my own in the world of self-employment. I think it’s wonderful what your friend has done. I also believe that temporary unemployment can lead to a permanent place in this world. Have you seen this? http://www.lemonademovie.com/ Merry Christmas, Jeff! Hope to see you soon. You are without a doubt the new poster boy for optimism and enthusiasm! Has been and will continue to be your secret to success. Let me know what I can do to help you land in the next great spot. Thank you so much for your kind words. You are definitely an inspiration to me! You sense of kindness serves to fuel those around you with the energy required to continue onward and upward! I’ve appreciated all of the prayers that you and your family have lifted up for my father and our family! The power of prayer has certainly been received in the Wolfe households this year! Thank you for sharing your link (http://www.centralvalleyactivist.blogspot.com/), which serves as a critical source of information for people located in the California’s Central Valley! May you and your family enjoy abundant blessings this holiday season, in 2010 and well into the future! Thank you for posting your message and sharing some inspiring thoughts. You are truly an inspiration to myself, as well as many others. I had never heard of http://www.lemonademovie.com/ before, so thank you for sharing! It looks like an awesome project! Your commitment to being a solid family man and cutting edge marketing provider is very strong! I’ve also been very impressed with how you have been able to make the “boring” insurance industry anything but boring with Atlanta Insurance Live! – http://www.atlantainsurancelive.com/. I’m very happy to see that you are part of the “Speed School” faculty! Sales Executives, managers and small business professionals will certainly benefit from your participation! Anyone interested in learning more can visit http://ypsgroup.com/blog/?p=120 or http://highvelocityblog.com/speed-school/ for more details! Todd, once again I appreciate your kind words and your friendship! We all share in many first days. Your optimism is catching. This site could be a new “first” for those you are struggling with job loss, or other needs, as a place to come for encouragement. I wish you the best in whatever your future endeavors are. I know that you will be a success wherever life takes you. Merry Christmas and God Bless you and your family during this time. Thank you so much for your kind words! I hope that 2010 is an especially good year for you! You are an amazing person and have a special gift for putting into words what so many people are going through in this difficult economy. I know we will both get through this difficult time and have an opportunity to collaborate on another project in the future! Best of luck to you! Thank you so much! I appreciate your kind words and look forward to the day when we work together again! That day will come…. Thank you so much for your kind words! I look forward to reading your blog posts!